Home > Products > Kilmacurragh Botanical Stairs canvas print by Rod Coyne. Kilmacurragh Botanical Stairs canvas print is born out of Rod Coyne’s Avoca Painting School. It’s a gestural painting which strikes a harmony between figurative and abstract. Rod’s canvas print is the perfect addition to any home or collectors wall. “I remember clearly the day I painted this piece. 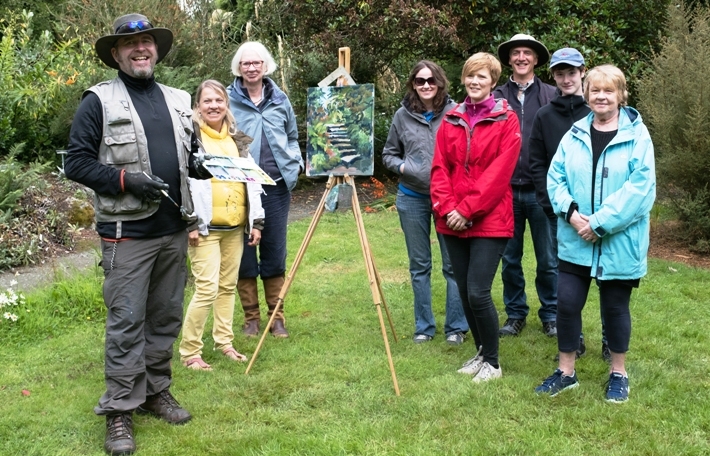 It was day 5 of our Avoca Painting School 2017 Painting Holiday, and our whistle-stop tour of Wicklow had led us to the Kilmacurragh Botanical Gardens. I started each day with a painting demo for the assembled students, always something fast and loose which they could use as a springboard to launch into the own day’s work. It being the the fifth and final plain air outing we we all completely in the zone having had a week of total paint immersion. Happy painting students with their tutor, Rod Coyne, team photo. I usually have a good idea of what I will depict during the demo long before the workshop begins, yet I do keep my options open for a last minute flash of inspiration. But Kilmacurragh is tricky as I never know what will be in bloom at any given time, not to mention that any amount of cutting might occur between visits thus utterly changing what I had imagined in my minds eye. This was turning out to be one of those days and I was casting around for a new motif to paint. I was feeling confident, with a weeks work under my belt, and felt I should be able to nail whatever it was I was going to put my artistic mind to.